One of the most thriving communities of online poker players in the world is located in New Zealand. They got everything down there from live tournaments that attract top players to top players like Lee Nelson from Team PokerStars. As a result the Kiwis have ample of choice to enjoy real money poker on the internet. Almost every online poker site accepts players from New Zealand. This is because the country is extremely open-minded towards online gambling, which includes poker too. The authorities don’t prevent New Zealanders in joining online poker sites. They don’t even impose tax on their winnings. With other words, New Zealand is the Promised Land for gamblers that want to play on the internet in peace from their own homes. What is the Regulatory Board that Monitors Online Poker Sites? Can I Deposit and Play with New Zealand Dollars? What Banking Options are Available at New Zealand Poker Sites? Do I Need to Download Poker Software? Do New Zealand Poker Sites Give Out Welcome Bonuses? 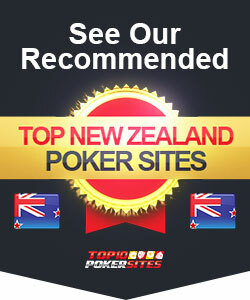 Are There New Zealand Poker Sites Optimized for Mobile Devices? The first and most important is the fact that no player will be held liable if he is discovered to be playing online poker for real money at an overseas website from within New Zealand. No player is at risk of any form of punishment contrary to other countries where people face repercussions such as funds seizure or even jail time. Your winnings will not be taxed by the New Zealand authorities, which is almost unheard of in other countries around the world. No provision issued by the Inland Revenue says that winnings from online gambling are going be taxed. The reason behind this is because online poker or gambling in general is considered just a hobby for the citizens. However, there have been reports that some players have been taxed because their poker-playing status was determined to be professional. In 2019 the Gambling Commission in New Zealand commissioned a report on problem gambling. The report shows that $60.3 million will have to be spent over three years on strategies relating to problem gambling. While offshore online gambling is illegal in New Zealand, that is under review, but there is no definitive answer as to whether changes will be implemented in 2019. Poker Legislation in New Zealand has been in effect since the Gambling Act of 2003. However, the gambling act only allows for the New Zealand Lotteries Commission and TAB to offer online gambling in the country. The last time legislation was updated in New Zealand was in 2009 when Player Information Displays were required for all poker games. However, the Gambling act of 2003 only pertains to online casinos or poker rooms operating in the country. The gambling act doesn’t specify that New Zealand citizens can’t play with poker rooms based outside of the country, but could potentially lead to legal issues and possible fines. With that said, there have not been any cases where individuals have faced prosecution for playing with operators offering services offshore. The history of gambling legislations in New Zealand is long. The Gaming and Lotteries Act of 1977 was one of the first notable legislations, followed up by the 1981 Boxing and Wrestling Act, 2003 Racing Act and the 2003 Gambling Act. The last one covers best all issues concerning online gambling such as poker, casino etc. The Gambling Act is quite clear that gambling over the internet is not illegal even if that website is based overseas. This is the main reason why all poker sites on the internet accept New Zealand players. Even though this act was amended in 2005 and again ten years later, none of these amendments changed the legality of online poker for the citizens. Of course, all of this could change in the future, but it’s very unlikely that it will. The Gambling Commission, the Ministry of Health and the Department of Internal Affairs all monitor specific parts of gambling both online and offline. The Gambling Commission is where gambling operators go when they want to renew their licenses or get a new one. The Ministry of Health is responsible for protecting those afflicted by problem gambling as well as preventing problem gambling in general. The of Internal Affairs is responsible for administering gambling legislation. However, keep in mind that you will not be protected or subject to the legal system of New Zealand in case you have fallen victim to fraud or unfair practices from an overseas poker site. You will be subject to the laws of the country where the site is hosted. This doesn’t mean that you are not protected. On the contrary, poker sites that accept New Zealand players are accredited by international gaming authorities. They are also independently audited by third-parties and certified in terms of the transparency, security and fairness. You just have to be careful not to sign up with poker sites that have constantly avoided such measures. While there is a variety of different poker software used online, many operators opt to use software created by established software developers. This includes Evolution Gaming, Microgaming and Playtech. Others will elect to develop their own proprietary software such as that seen at Bet 365 or 888 Poker. Whether you choose to play a proprietary software or listed software, players will have to experiment with the different kinds of games and software out there. There are two configurations of online poker software, allowing poker rooms to cater to the masses. Streaming, the most popular form of gambling now comes in the instant play format. It gives players the chance to harness these games directly through their web-browsers. The second configuration of these software’s is the downloadable form-factor, allowing for enhanced security by having the poker room directly downloaded onto your personal computer. New players always overlook one side of online poker to online poker, and that’s choosing the best time to play. There are those who will consider this odd, but fortune favours the bold. When you have a higher volume of players, generally there will be a higher number of cash tables available, and that can lead to substantially larger pots. During the peak hours at a poker room, new promotions and daily promotions are likely to be launched. Not everything is rainbows and sunshine during the peak hours at a poker room though; when you play a tournament, there will be an increase of players in the tournament. Consequently, this can make it harder to win the tournaments grand prize. We recommend that during the peak hours in the day at your chosen poker room that you play regular lobby games. This will increase your chances six to one over a tournament. Poker rooms offer players promotions that far exceed the expectations of a casino promotion. Not only are they more flexible in how they can be played and how cash outs can be obtained but it’s also more exciting to use. Poker rooms also design their promotions to be used not just by new players but also by day-to-day players with the brand. These generous gifts can come in many forms allowing for bonus credits to be added into accounts. The guidelines of a poker room bonus usually stipulate that it will be a 50% to 100% match bonus that can be valued up to $500 in bonus money. We recommend that players read through the terms and conditions of all promotions at their poker room. This is how you will find out what is required to cash out on the bonus and how long it will take for withdrawals to be paid. Dealing with financial transactions at a poker room can be serious for any player. What it means is providing your debit card, e-wallet or credit card credentials over to the establishment. This is one of the critical moments where players want to find out if a gambling regulator licenses the poker room they’ve selected. Subsequently, it will allow for financial transactions to be secured by Proxy Firewalls and Encryption Codes. The Encryption technology will pledge itself to ensure that your information never leaves the virtual walls of the poker site. Fans of online poker will have the ability to deposit and withdrawal with their debit cards, credit cards or e-wallets. Using a credit card with any poker room can be difficult as it depends on two stipulations. The 1st being if your banking institution allows online gaming purchases, and the 2nd being is your card offered as a deposit/withdrawal method. Using a debit card is considerably more convenient, as is using an e-wallet like PayPal or Neteller. Grasping the expertise that is required to master online poker can take years of dedicated persistence. Over time with dedication, it is possible to accomplish this goal, but nothing is likely without the help of others. Rely on the support of the poker community by reading thousands of poker tips and tricks that will let you gain knowledge on how every variation of poker can be won. New players will be taught when it be best to wager low on hands or bet big, what is best to do when they’re in a tournament or what cards create the best hands. These tips and tricks can be tested on free-to-play poker games, letting users master their skills before entering a real game or tournament. There is one question that everyone usually has before they play poker for the first time on their mobile phones or computers. That question being is it safe? That depends on the poker room you play with. Those poker sites not displaying a badge from a gambling regulator most likely runs their service in a shady manner. However, those poker rooms that do have a gambling regulators seal of approval means that they operate under strict security protocols which stipulate fair and safe gambling for all. This promise is accomplished through security programs like 551-Encryption Coding & Proxy Firewalls. It is incredibly easy to get swept away by a hobby that you enjoy and love. Everybody has done it during their life. It could be as easy as working out too much or playing poker on your computer too much. Most of the time we don’t even pick up on when we’re enjoying our hobbies too much. Luckily just like with anything else in life, there are rules you can set yourself to make sure it doesn’t happen again. With online poker, it’s always good to have a strict budget and to be aware of the responsible gambling programs in place at your poker room. This is a great way to make sure that your hobby doesn’t get in the way of anything else. This is the beauty of New Zealand poker sites. Since New Zealanders are major customers in terms of money and number of players, all major poker sites offer the option to make a deposit in NZD. Moreover, you get to wager in NZD. All of this eliminates problems like losing money due to the exchange rates etc. Based on the above mentioned reasons, major as well as minor poker sites that accept New Zealand players offer banking options that suit New Zealand players. For example, you can use POLi, Australia’s and New Zealand’s most popular online payment system. You can also use methods used internationally by other players too like Skrill, Neteller, Visa, Mastercard and many other depending on the poker site. No, but it’s recommended that you download it because that way everything’s more convenient for you. Instead of launching your browser each time to play poker, you can access the poker rooms directly from your desktop via shortcut. The graphics and sounds are of higher quality too. However, if you are using a public computer, it’s best to use the no download option. Of course, welcome bonuses and subsequent promotions are the backbone of this industry. Welcome bonuses are great because they make for an easier transition into playing on a new poker site. However, always find out about the wagering requirement before you accept any bonus. Some sites offer not so favourable conditions on bonus usage, which later can affect your ability to withdraw your winnings. You can’t proclaim your poker site as a top online poker establishment without offering players different ways of accessing the poker rooms. As a consequence almost every poker site that accepts New Zealand players has a desktop and mobile version of the poker client. This makes things more convenient for players that don’t have the time to use their PCs or laptops and mostly spend their time on their smartphones or tablets.